Trying to get the numbers to add up, mixing and re-adding, re-jigging and manipulating numbers and all those numerical formulae statisticians are oh so fond of (and which incidentally, I am not). That is what school capacity versus house building is all about in Dunfermline and West Fife, and quite possibly, beyond. Whatever way the Fife Council Administration wants to work the figures it all comes back to the same point. If you keep building houses you are going to bring people into the area which in turn means you are going to increase the school population. 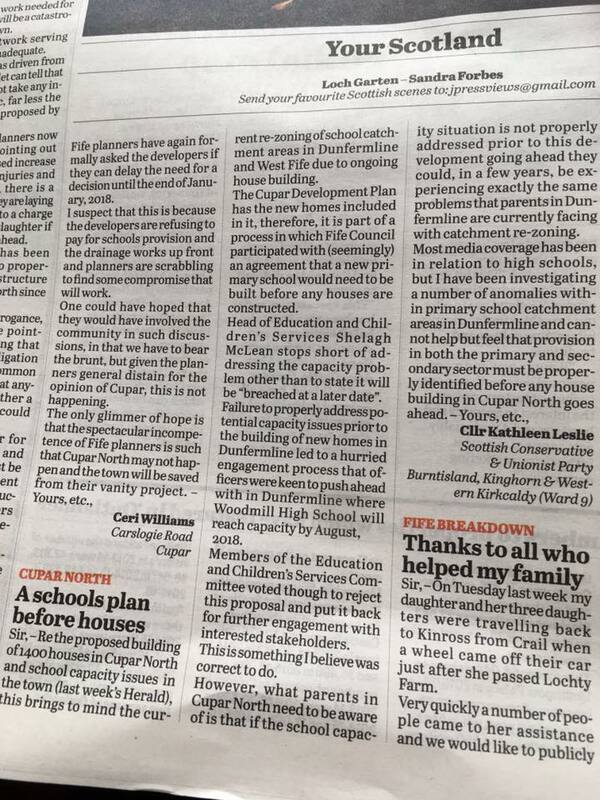 So much so that one out of the four Dunfermline schools is now about to reach capacity and similarly so (if we are to read into the headline of one local paper this past week) is the primary school estate in Cupar North if another house building project is given the go ahead by the Council. It seems though that despite a lengthy selection of pre-election promises on the part of both the then Labour Administration and their major opponents, the SNP (who are now incidentally snuggled up in a "shared administration" due to both failing to win enough seats outright to form their own administration), rather than address the long term issue - a need for new schools, a grand project of "rezoning" (it sounds almost science-fictionesque) is the way forward. After all that costs less money and means we can just do a bit of re-jigging of numbers (read - that means your kids) and redraw a few boundaries and voila - problem solved! 1. Provide temporary accommodation at Woodmill High School at a cost of £4.5 million. 2. Manage the existing pupil population in the Dunfermline and West Fife Area by rezoning the 4 secondary school catchment areas where household addresses and specific street addresses may be split to 2 or more separate secondary schools. 3. Rezone the catchment areas of the secondary schools by ensuring the secondary school is at the heart of the community, introducing continuous catchment boundaries and ensuring that addresses within a primary school catchment area are continue to the secondary catchment area. Officers recommended that the best option was number 3. They had reached this position due to feedback from engagement sessions in late 2016. However, councillors felt that this engagement process had not been sufficiently thorough and that further engagement should be sought. It was stated that capacity at Woodmill High School was likely to be an issue affecting 50 pupils by August 2018 and that if this went out for further consultation the process might not be completed in time. However, elected representatives did not quite agree with this summing up, which to set context was understandable - these plans had been drawn up pre-election. The political landscape is now somewhat different and there was a general feeling that given, what could be termed as, mistakes made before (and inevitably, the great phrase we are so fond of now - lessons learned) it was better to go back out to the public for further engagement. Had the proposal gone ahead it would have meant to alleviate the capacity issue in one school, some pupils (dependent on where their home address would fall in with the new boundaries) would be heading off to a different high school. That would be it, done and dusted. 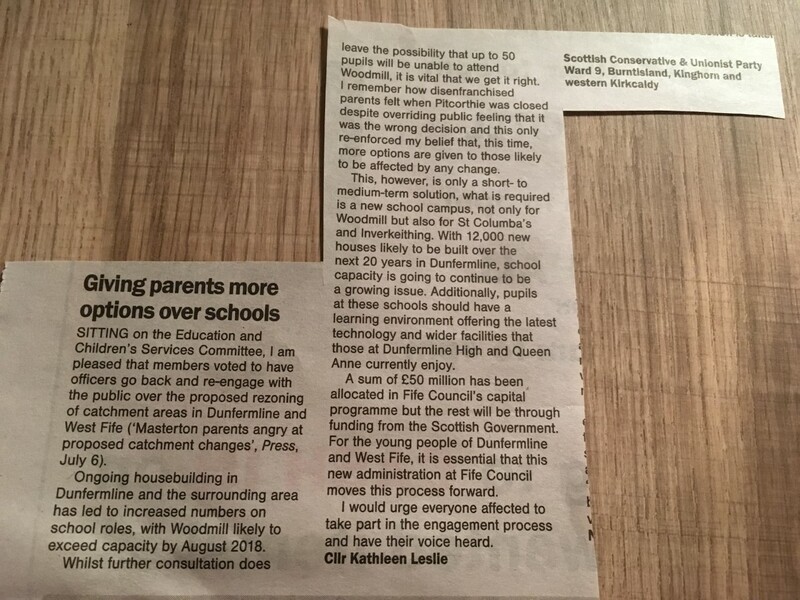 My major concern was that I was aware not all parents with youngsters in schools across Dunfermline and West Fife were happy with a proposal that they had not agreed to and had not wanted. I said throughout my election campaign that my major reasons for wanting to be elected was to give local people a voice and listen. For that reason I felt that more consolation had to take place. Mention the words - Pitcorthie Primary School, in Dunfermline and it will always evoke a reaction. A closure that was widely opposed and that stakeholders felt they were just not listed to in - to make the same mistake again and not listen should not be allowed to happen. I also felt that ultimately the re-aligning of catchment boundaries to manage a potential capacity problem in one school is simply deviating away from the much bigger issue. The school estate itself. There is not only a capacity issue but a need, a genuine need, for the school estate to be looked at. Promises and assurances and demands have been being made since 2015 from both Labour and the SNP about the new school estate in Dunfermline. To set this in context lets look at the following information. The Scottish Government’s £1.25 billion Scotland’s Schools for the Future Programme will see 67 new schools by March 2018, it seems though that the only school in Fife covered by this is the recently completed Levenmouth Campus. Whilst Dunfermline, Auchmuty and the Windmill Campus all benefited through the now completed Building Fife’s Future Framework initiative. However, comments by Cllr David Ross (leader of the previous Labour Administration and now co-leader of the new shared Administration) stated that whilst £50 million had been put aside for new school estates for Woodmill, Inverkeithing and St Columba’s and the 2 Glenrothes schools, a further £100 million would need to be forthcoming from the Scottish Government - and to be fair, he is correct. 1. Woodmill will reach capacity by August 2018 with the others likely to over the coming years. 2. Continued house building across Dunfermline means that new high schools with increased capacity will be needed. 3. Further consultation with stakeholders across Dunfermline & West Fife on rezoning will ensure there is engagement with those directly affected (something that Dunfermline parents have not forgotten following the much opposed closure of Pitcorthie Primary School) but that is not a long term solution. 4. More money is required to build these schools - £50 million allocated by Fife Council is a start but there needs to be funding at a national level to support this going forward. 6. The local paper in Dunfermline – The Dunfermline Press, has been running an Action For Schools campaign which has been in place for some months. This has created a sort of umbrella forum both in print and online where affected parents, carers, pupils and other interested parties can discuss and interact – it is successfully keeping the issue in the spotlight. As a Local Authority, Fife like others across Scotland is stuck. Budgets to local authorities have been cut by £160 million by this SNP government. If there are to be new schools that money has to come from the central pot and that is up to Holyrood to step up to the mark. Given that this SNP government and the First Minister herself has stated that education is their number one priority (failures in education over the past decade by the SNP is a whole other topic that needs a post devoted only to that) it would seem reasonable that pupils in the three schools that need replaced should have access to the latest technology, modern classrooms and wider facilities afforded to those at Dunfermline High and Queen Anne. Fundamentally, a discussion on new schools is needed and it is needed in the immediate future. Secondly, the SNP government needs to make funding available for new school estates. Below are two letters I have had published in regards to rezoning and the wider need for new schools. Sitting on the Education & Children’s Services Committee I am pleased that members voted to have officers go back and re-engage with the public over the proposed rezoning of catchment areas in Dunfermline & West Fife. Ongoing house building in Dunfermline and the surrounding area has led to increased numbers on school roles, with Woodmill likely to exceed capacity by August 2018. Whilst further consultation does leave the possibility that up to 50 pupils will be unable to attend Woodmill, it is vital that we get it right. I remember how disenfranchised parents felt when Pitcorthie was closed despite overriding public feeling that it was the wrong decision and this only re-enforced my belief that this time more options are given to those likely to be affected by any change. This however, is only a short to medium term solution, what is required is a new school campus, not only for Woodmill but also for St Columba’s and Inverkeithing. 12,000 new houses are likely to be built over the next twenty years in Dunfermline, school capacity is going to continue to be a growing issue. Additionally, pupils at these schools should have a learning environment offering the latest technology and wider facilities that those at Dunfermline High and Queen Anne currently enjoy. £50 million has been allocated in Fife Council’s capital programme but the rest will be through funding from the Scottish Government. For the young people of Dunfermline and West Fife it is essential that this new administration at Fife Council moves this process forward. I would urge everyone affected to take part in the engagement process and have their voice heard. Proposed building of 1,400 houses in Cupar North and schools capacity issues (Cupar schools are bursting at the seams) brings to mind the current rezoning of school catchment areas in Dunfermline and West Fife due to ongoing house building. The Cupar Development Plan has the new homes included in it therefore, it is part of a process in which Fife Council participated with (seemingly) an agreement that a new primary school would need to be built before any houses are constructed. Head of Education & Children’s Services, Shelagh McLean stops short of addressing the capacity problem other than to state it will be “breached at a later date”. Failure to properly address potential capacity issues prior to the building of new homes in Dunfermline led to a hurried engagement process that officers were keen to push ahead with in Dunfermline where Woodmill High School will reach capacity by August 2018. Members of the Education & Children’s Services Committee voted though to reject this proposal and put it back for further engagement with interested stakeholders. This is something I believe was correct to do. 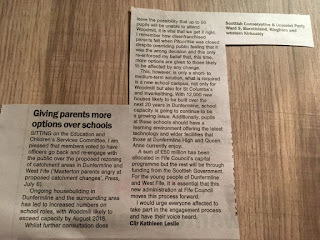 However, what parents in Cupar North need to be aware of is that if the school capacity situation is not properly addressed prior to this development going ahead they could, in a few years, be experiencing exactly the same problems that parents in Dunfermline are currently facing with catchment rezoning. 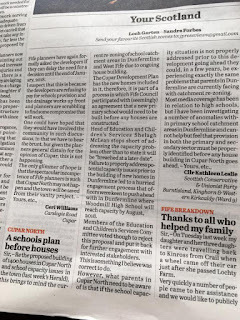 The majority of media coverage has been in relation to high schools but I have been investigating a number of anomalies within primary school catchment areas in Dunfermline and cannot help but feel that provision in both the primary and secondary sector must be properly identified before any house building in Cupar North goes ahead.